I’ve always been intrigued by this heart-shaped dessert molded in its only special ceramic dish with drainage holes. I was glad when coeur à la crème was chosen this month for French Fridays with Dorie. I thought it would make the perfect dessert for our Valentine’s dinner. I’d never had this dessert before, so had no preconceived notions. This time, I didn’t have the special equipment lurking in my basement, so I went in search of coeur à la crème molds. I found a selection at my new favorite kitchen store, Kitchen Outfitters. They offered both a large one and smaller individual ones. I opted for one large rather than a set of small ones because without knowing whether I would like the recipe, it was more economical (i.e. cheaper). I’d describe coeur à la crème like a cream cheese mousse. It was sort of like cheesecake, but much airier. You whip some cream cheese in the stand mixer with powdered sugar, vanilla, and liqueur (I used Chambord). 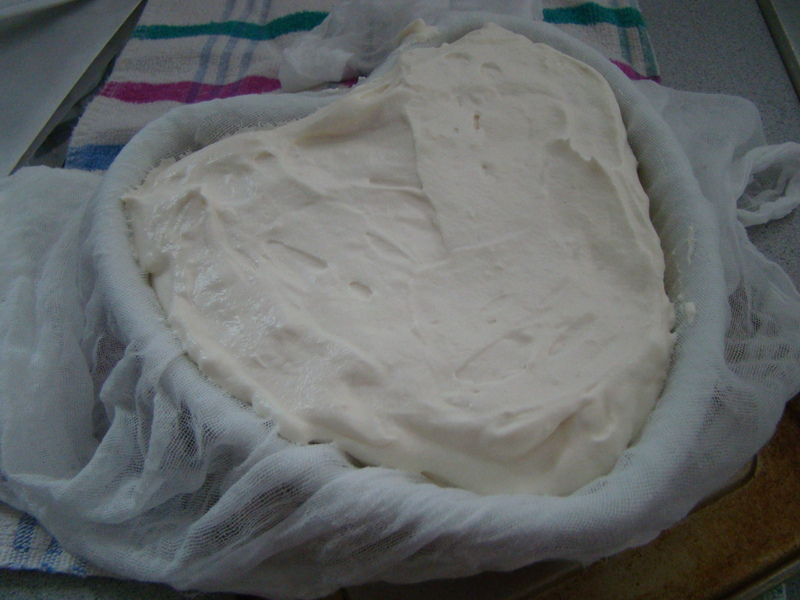 Then you whip some cream and fold it into the cream cheese. The concoction gets wrapped in cheesecloth and set in the mold to drain overnight, though my coeur didn’t give off much liquid at all. We don’t post the recipes, but you can find it in Dorie Greenspan’s book Around My French Table. To see what other Doristas thought of this recipe and whether their Valentines liked it more than mine, check out their posts here. On a more positive note, Howard did enjoy the rest of the meal. 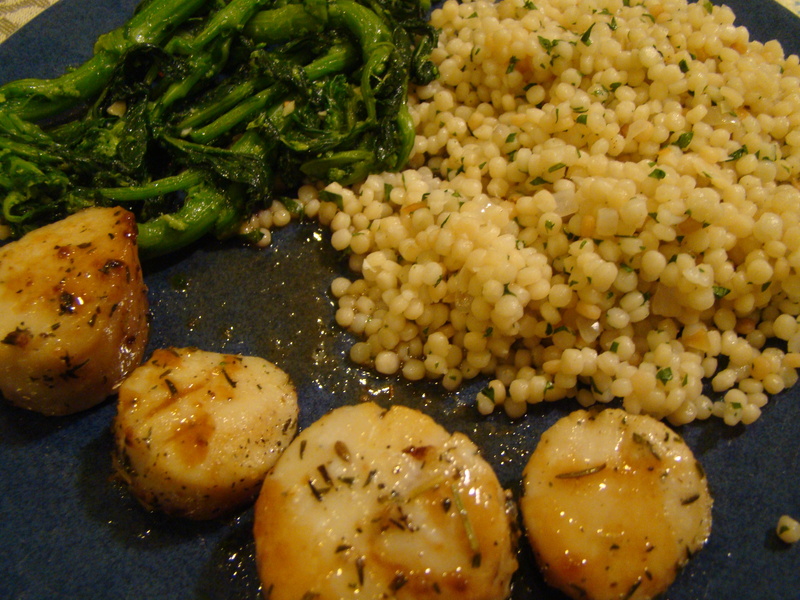 I made oven-roasted scallops, Israeli couscous and broccoli rabe. And, we drank a lovely bottle of Cava, on a weeknight, so it was decadent. 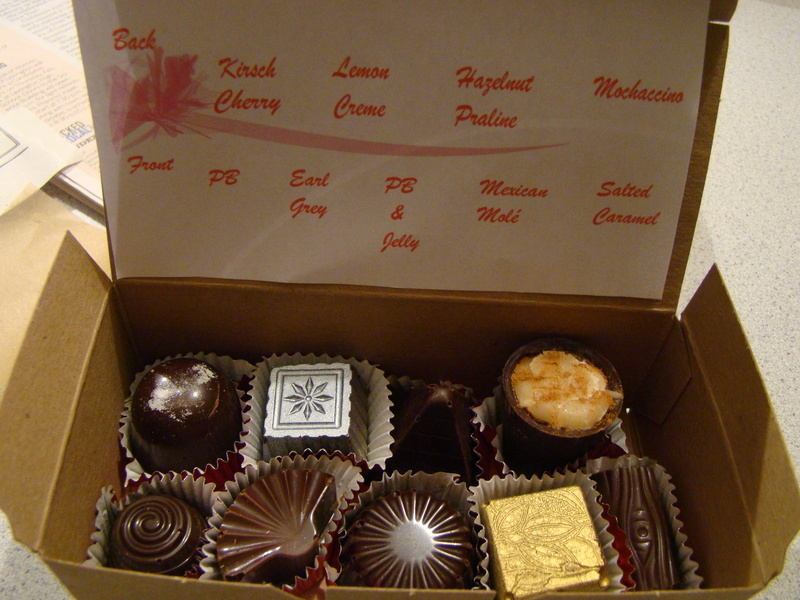 And, our friend Lauren stopped by with boxes of handmade chocolates! They are gorgeous, and the ones tasted so far, delicious. Posted on 15 February 2013, in French Fridays with Dorie and tagged desserts, French Fridays with Dorie, valentine's day. Bookmark the permalink. 19 Comments. Awww – you bought the mold :-) I liked the flavors on this but my execution was off. Cava on a weeknight, indeed! Ooh, “cream cheese mousse” is the perfect way to describe this! I really loved this one, but I gotta try it with raspberries sometime. Yours looks to die for. Lovely work! Pretty! Everything looks delicious, especially the chocolate. Happy day after V-day! 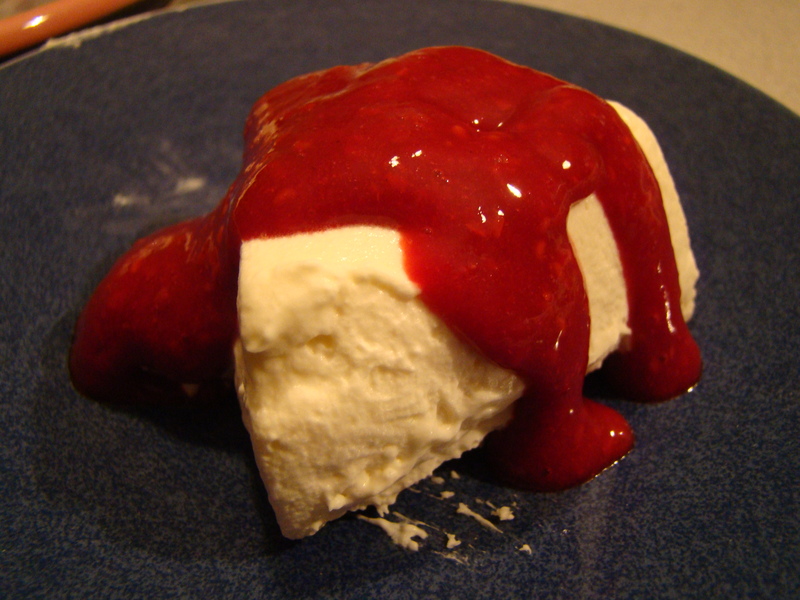 I couldn´t make this, but I like the way you describe it as a mousse. It does look wonderful Betsy! Have a great weekend. Oooooh scallops – so jealous! Those handmade chocolates look insanely good,but then so does each picture you shared. Wow you had a great meal :) I adored the dessert and almost wish I didn’t like it so well – it is way too easy to do damage to my diet. That is when I finally start it :) Great job ! I think if you’d said you went to your basement and just happened to find a heart-shaped mold with holes, I would have fallen off my stool. We knew Howard wouldn’t like it, didn’t we, and honestly, it’s too rich to eat on and on and on. I’ve yet to unmold mine but have tasted it – delicious and rich. I made the same raspberry coulis with no sugar added. I think this is a very elegant-looking dessert, a wowser, so will probably make it every Valentine’s Day to amortize out the costs of the two 7″ molds. Your meal does sound and look delicious. What an interesting meal choice. I would have enjoyed that meal also. Would you believe I never made anything with broccoli rabe? I don’t want to talk about the chocolates. You have nice friends. What fun! Your dinner looks delicious!! While I love dessert, I always get sidetracked by the main event!! How wonderful to have a friend bringing homemade chocolates. So beautiful, but I suspect even more yummy. Alas, I didn’t get to this. Maybe soon? I have to chuckle. I feel like I “know” so many of my fellow Doristas so well, even though we have never met. But actually, we are also getting to “know” each others families a bit as well. Does Howard know that there is a whole online community of cooks who are well educated on his food likes and dislikes? LOL! He’s very aware. Howard insists I’m making fun of him and that everyone knows it. I say I’m just laying out the truth, as I see it. I think (hope) he takes it all in the light-hearted and affectionate spirit intended. It sounds like a wonderful celebratory dinner, even if the dessert wasn’t a hit with Howard. Those chocolates look professional, too! A lovely looking dessert – a shame Howard did not like it. Love the cous cous, and Lauren can come again for bringing such gorgeous chocolates. Betsy, Sorry this wasn’t a hit in your house! It certainly looks beautiful! My family really enjoyed it! Your mouthwatering dinner looks amazing! yes, cream cheese mousse! Exactly. Mine didn’t drain though so when I had to make it again a few days later for family I used a different recipe that made it a bit denser. Betsy, I am seriously jealous of the heart-shaped molds by now…as I told Mary, I believe this traditional French dessert is now American-French because not even my trusted French porcelain store carries these molds anymore. Your picture are all wonderful but personally, I like the first one most – shows the cloth and the mold and the fresh cheese mixture, I just really like that photo! I’m drooling over your dessert AND your scallops! Your coeur with the raspberry sauce looks wonderful, Betsy. I am sorry that Howard didn’t like it, but glad that he enjoyed the rest of the meal. It looks and sounds fabulous. And those box of handmade chocolates – Wow! What a perfect ending to a marvelous meal. You’ll have to try my chocolate version now you have the mold ;) Howard might like that version!